I had just recently signed up for Artst.com and uploaded some work on there. 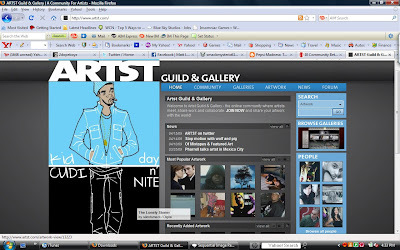 Come to find out from a fellow artist that my Kid Cudi piece was featured on the front page of the site. That's wassup! And since Pharrell is involved with the site (or at least that's what he said during the N.E.R.D. concert), Pharrell just inadvertately gave my work his stamp of approval. Win. Now I go back to writing papers and finishing up works for finals. NO SLEEP! NONE! ...oh....NEW "SMACK CHRONICLES" (sometime) this week. Promise. I'm coming back with it strong! Or at least I'm gonna try to.